Custom embroidery available at Stitchy Lizard. We are located in Liberty Village, Toronto, Ontario. You are welcome to visit our showroom. Most of our apparel on the website includes embroidery up to 10,000 stitches or 1 colour screen printing. For design over 10,000 stitches, please send us the artwork and we will be happy to provide you with a quote. Most hat and left chest designs are under 10,000 stitches. Here are samples of designs and the stitch count. We can also do embroidery on customer supplied items. Please note that our minimum is 12 pieces. You will be required to sign a waiver for all embroidery on customer supplied items. We also have the right to refuse certain items if they are not suitable for embroidery and can damage our embroidery machines. Please send us your artwork, description of your items and we will be happy send you a quote. Embroidery is an elegant and stylish way to decorate or personalize any garment or embroidery friendly item. 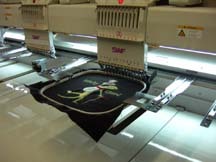 The digitized image is saved on disk and loaded to the embroidery machine. The machine uses the digital instructions to create your design with threads. 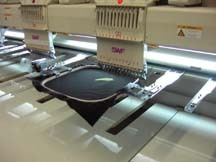 The number of stitches that the machine needs to make, the quantity of items being embroidered, and the location of the embroidery determines the embroidery cost. Any design that will need more than just keyboard lettering will have to be digitized. Digitizing is the process of taking an image of your logo and converting into stitches using specialized software developed especially for the embroidery industry. Refer to our Digitizing section to learn more on digitizing. - Change Lower case lettering into Uppercase. - Eliminate some of the letters or place the letters on 2 or more lines. - Arc the lettering around the logo. Lead times vary but our average delivery times are between 5 to 10 business days. Lead times for digitizing artwork requires 1 - 3 days. 50% deposit is required when ordering and balance is due upon delivery. We gladly accept Visa or Mastercard. Many fonts are available. 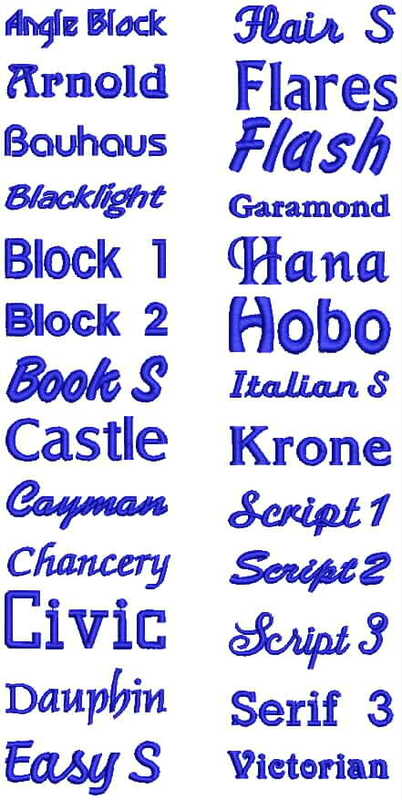 Shown below are a few samples of embroidery fonts we carry.